Play out exciting duels above the sand dunes with this iconic set featuring Jabba the Hutt’s ‘hovering’ skiff with extendable plank, storage hold and movable rudders at the back. Help Han Solo fend off Boba Fett and the skiff guard before his friend walks the plank and falls into the mighty Sarlacc’s minifigure-devouring mouth. Includes four minifigures: Han Solo, Chewbacca, Boba Fett and a Skiff Guard. Features a skiff and a Sarlacc pit. Skiff features an extendable plank, storage hold, movable rudders at the back and transparent elements underneath for a ‘hovering' look. Sarlacc pit features tentacles, teeth and an opening mouth with space for a minifigure. Weapons include Han's blaster pistol, Boba Fett's special blaster pistol and an axe. Also includes handcuffs for both Chewbacca and Han Solo. Recreate iconic scenes from Star Wars: Episode VI Return of the Jedi. Skiff measures over 2” (6cm) high, 9” (24cm) long and 5” (13cm) wide. Sarlacc pit measures over 3” (10cm) high, 3” (9cm) wide and 3” (9cm) deep. 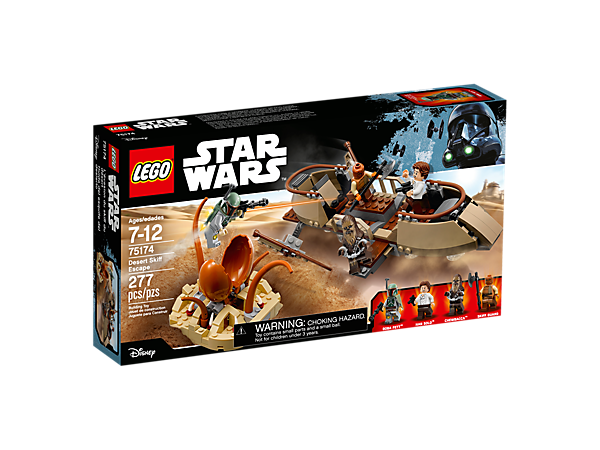 Does anyone have the Desert Skiff set 75174? I'm contemplating getting it. Last edited by Jeremy; 12-05-2018 at 07:49 PM. Thanks, just after opinions really - the skiff looks a good build and it's a decent price so just wondered if people thought it was a good value set. yeah it's a great little set. You just missed them at Target where I think they were an exclusive. They clearanced out for as little as $15.00 at some stores in my area. Good luck and happy hunting. Folks, I created this thread from the stub of a conversation in Recent Acquisitions - LEGO Edition so it could stay contextual to the set. If you check the LEGO Thread Index and don't see a thread for the set you want to discuss please don't be shy about creating a new one. Last edited by Jeremy; 12-05-2018 at 07:54 PM.